To his family in Jordan, Raed Mansour al-Banna was a beloved son who wanted to make it in America. To his American friends, he was a sweet guy with a charming smile who loved to party. To the families of the 166 people he killed in Hilla, Iraq, he was a murderer. Charlotte Buchen is a student at the UC Berkeley Graduate School of Journalism. On June 14, 2003, a U.S. Customs and Border Protection (CBP) officer at Chicago's O'Hare International Airport was interviewing dozens of passengers off KLM flight 611 from Amsterdam whom had been selected for additional questioning based on pre-flight intelligence. One of her interviewees was a young lawyer from Jordan named Raed Mansour al-Banna, who claimed to be visiting an uncle in nearby Oak Lawn. Al-Banna, says the CBP officer, was calm and polite. His documents were in order. 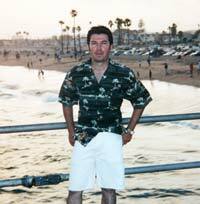 They showed that he had lived in Los Angeles for about 18 months, starting in 2001. He was on a legitimate B1/B2 tourist visa to take English classes. Al-Banna had received an extension to his visa and had traveled back and forth between the United States and Jordan several times. But after failing to explain to the officer how he had supported himself during his lengthy stay in America, al-Banna finally admitted that he'd held numerous petty jobs while in Los Angeles. "Of course, that's not allowed," the officer said, referring to his working without a green card. The visa violation was grounds for removal, so she took a mug shot, fingerprinted al-Banna and deported him on the next KLM flight. 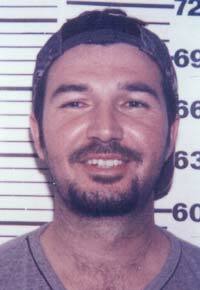 The photo taken that day shows a handsome man with a big smile and a baseball hat perched backwards on his head. A year and a half later, in February 2005 a suicide bomber drove a car full of explosives into a crowded bazaar outside a health clinic in Hilla, Iraq, killing 166 people and wounding 146. It remains the deadliest suicide-attack in the country since the U.S. invasion, according to the latest statistics from the Department of Defense press office in Baghdad. Inside the charred vehicle, an Iraqi fireman found the driver's hand chained to the steering wheel. According to former CBP Commissioner Robert Bonner, the fingerprints taken from the hand matched al-Banna's. The CBP officer heard the news later that year. "I was shocked," she said in a phone interview. "That it was so close to home, that I actually interviewed someone who not only was capable of doing but actually did something like that. You never know who you are interviewing or what they are capable of doing." There is no indication that al-Banna had reentered the United States in 2003 to commit a terrorist attack. "I don't know what the heck he was going to do, but we didn't believe him," said Bonner. Bonner and Secretary of Homeland Security Michael Chertoff have both touted the al-Banna case a success story for the young Department of Homeland Security (DHS), of which CBP is a part. Al-Banna's removal is also an example of the government's "new paradigm" of preventing terrorist acts by arresting or deporting suspected terrorists for lesser infractions before they can carry out an attack. It also has parallels to the case of the two Lodi, Calif. imams suspected by the FBI of recruiting for terrorist training camps in Pakistan. Despite years of surveillance, the FBI did not prosecute the imams. Instead, they were found to be subject to removal by the Justice Department's immigration court. They were allowed to depart voluntarily rather than be detained or forcibly removed. "There is a clear rationale for using deportation as a counterterrorism policy, because it allows domestic customs agents to sidestep the messy process of terrorism prosecution and literally remove the problem from U.S. soil," said Emily Hunt, a Soref Fellow at the Washington Institute for Near East Policy. The inherent flaw in the system, she said, is that once a subject is outside the U.S. government's reach, he or she goes into an intelligence "black hole." Deporting al-Banna kept him out of the United States but couldn't prevent the carnage he inflicted in Iraq. "We have this idea that we're deporting someone and that emasculates them," said Nora Demleitner, professor of law at Hofstra University. "If the suspect is in fact a security threat to the United States, simply removing the individual does not reduce their desire to commit terrorist acts." According to the CBP, if a person's visa is cancelled in the process of removing him or her from the United States, notification is made to the U.S. embassy in the applicant's home country. But critics say the system relies too heavily on follow-up by foreign governments. "There is essentially no monitoring of an individual once he has been deported," said Hunt. Relying on foreign intelligence is only a partial solution. In some cases local authorities may briefly hold a person, but unless the subject has committed a crime under the law of their home country, they may have to be released. "It's the best of bad options," said Hunt. Both the United States and Europe, she said, routinely remove suspected terrorists from their territory. Ironically, they may be exporting radical Islamists to countries with functional terrorist networks where they can operate more easily. If the Lodi imams were recruiting for Al Qaeda, as the FBI suspected, it is unclear whether deporting them to Pakistan hindered or helped their activities. Raed al-Banna came from an upper middle-class family in al-Salt, Jordan. A law school graduate, he admired the United States, according to friends interviewed for this story. Al-Banna first arrived in Los Angeles in June 2001, working various odd jobs before finding work as a pedicab driver at LA-Ontario International Airport, bicycling passengers between the parking lots and the main terminal. At the airport he made his first American friends, his fellow pedicab drivers. The drivers, as freelancers, relied solely on tips, and al-Banna was a hit with his customers. "It takes a special person to know how to deal with people," said Devin Duran, former owner of the pedicab business. "He had a nice, gentle way." "He was a cool guy to hang out with for a long time," said Steve Gray, a former friend of al-Banna's in Los Angeles. Gray, who used to work in the music industry, says he took al-Banna to clubs in downtown L.A. and that al-Banna was a "hedonist" who loved motorcycles, women and partying. "His purpose in life was to have a good time," said Gray. "He never went to the mosque." Yet al-Banna's Los Angeles friends say they saw a radical transformation in him before he left the United States in 2002. "Every time he went back there [to Jordan] he got more and more indoctrinated," said Gray. Duran said al-Banna seemed totally different after his final four-week trip to Jordan. "When he came back, he was solemn," he said. "The guys tried to egg him on but he said, 'I'm back to my religion.' This time he was not joking." Al-Banna quit the pedicab job soon after, when one of his co-workers insulted the Koran. In retrospect, Duran said there were signs that should have raised suspicion. He wonders now how al-Banna had the money to travel back to Jordan twice, as well as rent an apartment in nearby Alta Loma. "Something wasn't right," said Duran. "There were always different Arab guys picking him up, dropping him off. But none of us ever went into his house. He didn't have a cell phone -- every cell phone was always under the name of the guy that was staying with him." Duran said that when he found out al-Banna had been identified as a suicide bomber, he tried to share information with the FBI but was told they had the case "cracked." He was never called to the field office to be interviewed. Steven Gray also said he was never contacted by the FBI. Laura Eimiller of the FBI's Los Angeles press office said the case was "thoroughly investigated" to determine if al-Banna had any terrorist ties here in the United States. "It goes without saying that the Bureau would investigate possible terrorist links to an individual who executed a suicide mission overseas and who at one time lived in the United States," she said. "Beyond that we are not able to comment on specific details." "May Allah bless Abu Radwan and give him strength -- how handsome and pure he was! The martyr, may Allah have mercy on his soul, was rather distant from blessed Allah before he was guided towards Islam. … [O]ur brother delivered death from out of nowhere to the enemies of Allah." FRONTLINE was unable to reach the al-Banna family, but Samia Kabariti of the Jordanian Embassy in Washington issued a statement on behalf of the family. "The al-Banna family does not support the notion that Raed al-Banna was a suicide bomber," she wrote in an email. The family has said they believe Raed died fighting with insurgents near Mosul. But shortly after the Hilla bombing family members published an obituary in the Arabic-language newspaper Ad Dustour that read: "Announcing the death of a martyr who got his martyrdom in the land of Iraq at the age of 32. Don't think that those who were killed for God are dead -- quite the contrary. They are alive, and are even born again." Raed's father Mansour al-Banna told The New York Times and other newspapers that he wasn't involved in the writing of the obituary. FRONTLINE contacted the FBI, which normally handles fingerprinting in such cases, to confirm the match between al-Banna's prints from O'Hare and the prints found in Hilla. FBI spokesperson Bill Carter said the FBI had not done the identification, but that it was possible that the Department of Defense may have made the match in this case, meaning the results might be classified. Back in the United States, CBP officers at O'Hare airport continue to process passengers arriving from 78 international flights every day -- almost 2 million foreign visitors annually. Today, all CBP officers receive special courses on anti-terrorism training and fraudulent document detection; those who are a part of Counter-Terrorism Response (CTR) Teams receive additional training. The CBP officer involved in al-Banna's deportation earned a Commissioner's Award. She says the case is incentive for her to stay focused and proof of her ability to make a difference. "I'm just happy that everything worked out in terms of here in the U.S.," she said. Nonetheless, al-Banna's case serves as a bloody reminder of the limitations of America's deportation strategy for fighting terrorism. Marlena Telvick, one of the Associate Producers of "The Enemy Within," contributed reporting to this article. This article was a project of the Investigative Journalism for Print and Television Seminar at the University of California at Berkeley, Graduate School of Journalism, taught by Reva and David Logan Distinguished Professor Lowell Bergman and Rob Gunnison under the direction of investigative journalist Marlena Telvick. Reporting by Jeff Kearns, Charlotte Buchen, Jordan deBree, Cathy Bussewitz, Lee Wang and Center for Investigative Reporting intern Taylor Valore. Additional research by Matt Levin, Kate Golden and Joseph De Avila. Additional editing by Alison Pierce of the Center for Investigative Reporting. Special thanks to the Reva and David Logan Foundation and the Gruber Family Foundation.